Our digital x-rays are computer-generated images, requiring up to 90% less radiation than the conventional film x-rays. With this technology, pictures are taken via a small electronic sensor, which instantaneously transmits a picture of the tooth onto a video monitor in the treatment room. Digital x-rays do not use chemicals and film which pollute the environment. We are convinced that digital x-rays make a more accurate evaluation of even the most complex dental conditions. 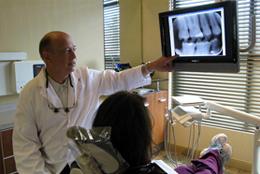 We can examine the outer and inner tissues of each tooth, as well as the surrounding roots, root canals and gums. The process of digitally capturing an image is much faster, safer and more comfortable for the patient. By seeing your teeth and surrounding structures immediately, we are able to clearly and simply explain all the steps of any recommended restoration procedures. Better understanding makes for better decisions which makes for better care.